Text of the Declaration of Independence, from Benjamin Franklin's Print Shop at Franklin Court. To fully appreciate the crispness of the text, just click directly on this photo to enlarge it. On July 4, 1776, the pivotal event in American history took place, the one that would ultimately prove to divide everything which had come before, with everything that would come after. 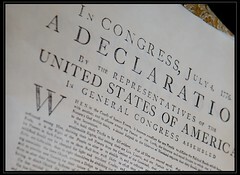 On that date – now revered as Independence Day - the Second Continental Congress gave its final approval to the Declaration of Independence, at the Pennsylvania State House. We know that building today, of course, as Independence Hall. ROGER SHERMAN, SAM'EL HUNTINGTON, WM. WILLIAMS, OLIVER WOLCOTT. WM. FLOYD, PHIL. LIVINGSTON, FRANS. LEWIS, LEWIS MORRIS. RICHD. STOCKTON, JNO. WITHERSPOON, FRAS. HOPKINSON, JOHN HART, ABRA. CLARK. ROBT. MORRIS BENJAMIN RUSH, BENJA. FRANKLIN, JOHN MORTON, GEO. CLYMER, JAS. SMITH, GEO. TAYLOR, JAMES WILSON, GEO. ROSS. SAMUEL CHASE, WM. PACA, THOS. STONE, CHARLES CARROLL of Carrollton. GEORGE WYTHE, RICHARD HENRY LEE, TH. JEFFERSON, BENJA. HARRISON, THS. NELSON, JR., FRANCIS LIGHTFOOT LEE, CARTER BRAXTON. EDWARD RUTLEDGE, THOS. HAYWARD, JUNR., THOMAS LYNCH, JUNR., ARTHUR MIDDLETON. If you'd like to leave the Declaration of Independence, and return to the Independence Hall main page, please click here.